AP H&R CE Engineers Training – Reach Foundation: Conserve our Rich Heritage!! A three day workshop was conducted on the 27th, 28th and 29th of December 2010, at the Sri Venkateswara Employees’ Training Academy at Tirupathi, by the Endowments Department of Andhra Pradesh, in collaboration with REACH foundation an NGO working towards heritage conservation. (www.conserveheritage.org), to educate their staff on the correct measures and methodologies on heritage conservation, applicable to the temples across their state. REACH FOUNDATION has been working on areas like conservation and renovation of ancient temples and heritage structures, teaching inscriptions to interested persons and conserving antiques in many private collector’s museums. It also conducts awareness camps throughout the state of Tamilnadu on the understanding and appreciating heritage structures and the importance of ancient science. The three day workshop was inaugurated by the traditional chanting of mantras by the devasthanam priests. The SV university girls rendered few invocation songs. The 5 faces of the traditional lamp was lit by the Honourable minister for endowments, Shri.Jupalli Krishna Rao, Shri. JSV Prasad, the commissioner of endowments, who was instrumental for this workshop to happen, the founder trustee of REACH, renowned archaeologist Dr.T.Satyamurthy and then Velu sthapathi from the endowments department and finally by Joint E.O of Tirumala Tirupathi Devasthanam, Shri.K. Bhaskar. The minister inaugurated the workshop and also released the conservation manual prepared by REACH FOUNDATION specially for the A.P. endowments department. While addressing the gathering, the minister lauded the effort of their department seeking technical advise from the archaeological and conservation experts, instead of allowing modern construction methods creeping into the temple renovations, thus depriving the temples from its originality and antiquity. He assured that his Government would surely apply the models laid out as a result of the camp and would henceforth take the issue of conservation seriously, thus preserving the heritage temples across the state. Dr. T. Satyamurthy, who delivered the key note address emphasised on adopting the traditional concepts and ancient science to prolong the lives of all heritage structures, than blindly following modern methods.He said, they were not against modernity, but chose select proven methods where need be, but try to minimize the use of modern materials and stick to the traditional time tested materials and methods for conservation and renovation, deploying the age old Jirnodhara concepts. The commissioner was more vocal and straight forward in his observations on the current practises his department followed. He dissuaded the engineers from allowing mosaic tiles, acrylic paints and cement based gaudy constructions on and above a heritage structure. He said the conservation manual would henceforth be their guide book and no one should submit quotations only with an MLA’s letter and cost, but also include the technical evaluation of the structure, giving due importance of retaining the originality of the heritage temple. In fact, after every session, the commissioner used to throw questions on the participants, and if found they were not able to answer, he would give the answers from the points he had jotted down.Dr. Badrinarayanan, former director of Geological Survey of India explained the basic types of stones used in heritage temples, and those available in Andhra, the key differences and methods to identify a male stone, or a femal stone or a neutral stone. Shri. Kanade, Shri. K.K.Ramamurthy, Mr.Dayalan, Mr. Sriraman, Ms. Srilatha all experts from the Archeological Survey of India addressed the gathering with documenting methods in temples like Ankorvat, Restoration of temples in Kerala, Methods to follow while conserving a temple, conservation of bronzes and murals in temples, respectively. A paper on the various activities done by REACH and another paper on importance of lime and lime mortar written by Shri. Tapan Bhttacharya of ASI, Kolkatta was read out by their PRO, J.Chandrasekaran. Members P.N.Subramaniam, and Ramnatha Mani gave ample support and back stage arrangements for all the papers to be presented on screen without any hindrance. The 200 odd mebers of the Endowments department were disciplined lot and attended both days’ session with great interest and enthusiasm. The group of senior staff including the sthapathis Rangarajan and Velu, Srinivasan, and the Chief engineer R. Jagan Mohan and his team of engineers did an excellent job in coordinating the whole event which includes stage arrangements, banners, food and tea, accommodation and darshan arrangements for the whole group, etc, in detail and were very professional in their approach and deliverance. Special thanks to Shri. Subbarao who was the man Friday for all activities who worked as abridage between the REACH, the NGO organization and his department. Also we should mention special thanks to Mr. Srinivasan who was made in-charge for the guest house and food arrangements.His hospitality and availability at all times for the visiting conservation experts is worth mentioning. The photos are here to see. REACH also did a quick trip to the Vakulamma temple atop a heavily quarried granit hillock, lying just outside the Tirupathi city on the Nellore Highway. Quarrying was rampant around, and the temple atop is sure not seeing any pooja for atleast 500 years. No way to go atop, REACH wanted the TTD to take care of this heritage temple which incidentally happens to be the temple for the mother of Balaji, Vakuladevi!. 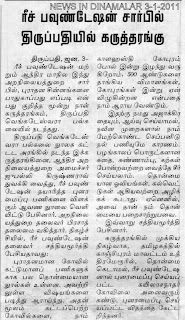 The sad plight of Vakulamma temple is shown here. The members also went for a trip to the Gudimallam Shiva temple, considered the oldest living temple in whole of India, which has the Shiva linga with a human figure made as a relieved structure from a well polished stone. this temple is now maintained by the ASI and is close to the Renigunta city. Please click here for photos.The special darshan arranged by the commissioner atTirumala, for Balaji darshan and the laddus we carried back home, made thid event a memorable one and of course a mile stone in REACH’s activities. On the 29th, the whole team visited Uttaramerur Kailasanadar Temple, renovated by REACH and also visited the Sundaravarada Perumal temple, also a heritage Pallava period temple, retained in its prestine grandeur and style, located in the same place. Various aspects of renovation were explained to the visiting engineers and officers and site work on stone, granite stitching method and stucco and on lime -mixing were explained to them in detail. This we think is a first time collaboration between a Government Endowment board and a dedicated heritage conservation oriented NGO,happening in India. , they will share the best of their expertise and make this wedding a memorable one!